He would like to know the name of the station. Of course we would like to know much more. There would appear to be LNWR and GWR timetables on the wall of the far (original?) building. Which station? What is the date? What is the occasion? Class of Locomotive? Loco is 4-6-2 Superheater Tank.�Location somewhere on Central Wales line - at a guess Llandrindod Wells - and if so train probably heading towards Swansea.� Occasion - don’t know but looks like something special.� Date - at a guess - c1912. Both shots are of Llandrindod Wells on the Central Wales line. It’s Llandrindod Wells OK, but the train is�headed in the Shrewsbury�direction.�1912 sounds likely; certainly before WW1 because of the clothes visible.�I wonder if these were taken at the same time as the well-known similar shot showing two Webb tanks entering? The photograph with all the people on the up platform are awaiting the London Euston express which ran via Shrewsbury and Stafford, on this occasion this particular photograph was taken in 1905. 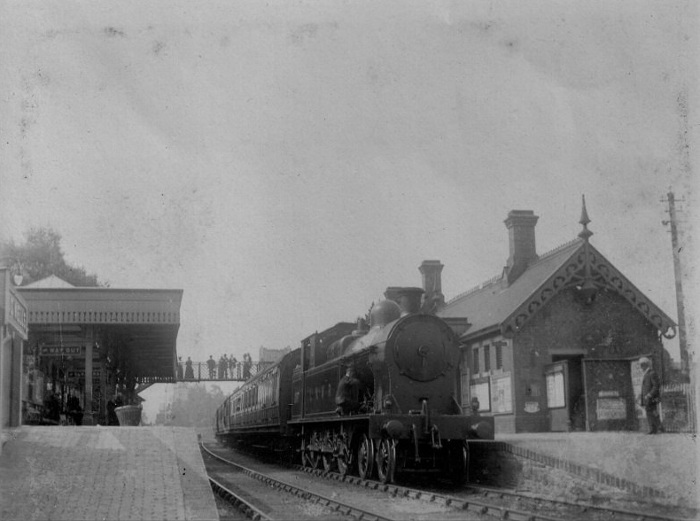 The other one showing the train in the same up (Shrewsbury bound) platform was definitely taken just before World War 1 and before the extension of the platforms and the lengthening of the awnings on the same platform beyond the footbridge in the early 1920’s. The down platform had a signal box that operated the points into the station from the Swansea end with the extended platform curving with the track towards the road-bridge some 50 yards south of the station, the down platform buildings changed little until the mid 1980’s when the attractive awning was removed because of the condition and replaced with the awning that appeared from one of the towns attractive buildings in the early 1990’s that had been demolished. The reason I have come up with this conclusion is that the costume is the same as an old gazetteer entry that shows the shot of the double headed Webb engines at the head of the London train of 1905, the two men talking at the notice boards are walking down the platform towards the train as it arrives in the photograph that you don't appear to have. The Trees behind the footbridge are at the exact same height and position as on the 1905 photo. The luggage piled precariously on the trolleys are evident of the many hotels that hired same to meet arrivals and departures which would strongly indicate that the volume of luggage that would be going on a longer distance such as London as the majority of the traffic was Shrewsbury - Swansea with some notable exceptions such as Manchester, Liverpool and York, the latter served by the last Mail and passenger train of the day and also from York in the early hours serving a down (Swansea Victoria bound) service that arrived in Llandrindod Wells around 5.15am on Mondays to Saturdays, a pattern that remained unchanged throughout the ensuing years.